We find that lights and fans need to be switched on right before the show starts. And also these light need to be switched off in audience section and turned on in the auditorium stage section when show starts. Sometimes the lights in a particular part of auditorium need to be switched on to point out to that group or section (Suppose the college principal wishes to credit the junior college staff, then the lights right above where junior college staff sits in audience will be switched on). In such cases it is not possible and advisable for operators to run here and there to switch on lights in particular areas. 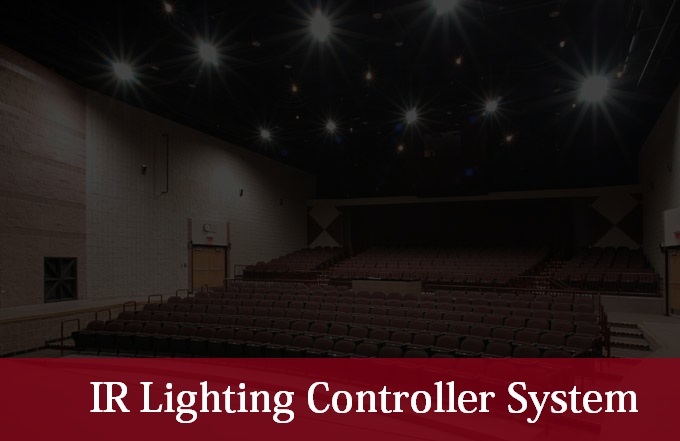 So this project here proposes an IR remote that can control all lights and fans to in the auditorium with just a few buttons. Every light switch is fitted with an IR receiver. As soon as a button in the IR remote is pressed the IR transmits corresponding signal, it is received by corresponding receiver. This output is then passed to the microcontroller and it switches on or off the corresponding light/fan. It can also be used to control light on/off status in events, marriages, movie theatres and marriages to provide custom lighting changes instantaneously as desired.